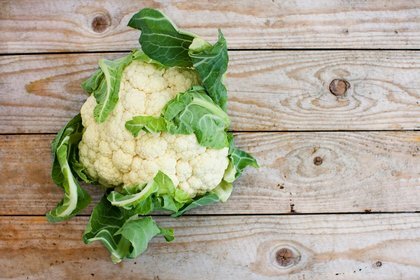 Cauliflower is the chameleon of vegetables. We have mashed it instead of potatoes with great success, and have used it to create a crust for pizza. It is delicious roasted, and makes a creamy soup that doesn’t require any cream. Tonight, cauliflower is sitting in as rice to become layered with a spicy, saucy chicken dish. It’s an easy substitution, resembling rice in color and texture, while saving about 220 calories per cup. Wash one head of cauliflower, and break it into florets. Allow it to dry. Place the florets into the food processor and pulse until they resemble the consistency of rice. It is best to do this in 2 or 3 batches so they don’t get too finely minced. Cook your “rice” either by steaming it briefly, with very little liquid, or by sautéing it in a little butter or olive oil for about 4-5 minutes until cooked through and slightly browned, but not mushy. You can doctor it up by adding a little sautéed onion and garlic, and a little chicken stock for flavor. Use as you would rice, and enjoy! This entry was posted on October 1, 2014 at 7:03 am and is filed under Food. You can follow any responses to this entry through the RSS 2.0 feed. You can leave a response, or trackback from your own site. I definitely really liked every little bit of it and i also have you book marked to see new things on your website. it. Thus that’s why this article is great. Thanks!